OdourPro's carbon filters use activated carbon to alter hazardous gases and Volatile Organic Compounds (VOCs), reducing toxic odours by up to 99%. 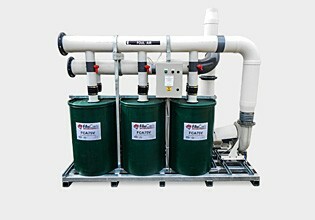 Carbon filters can be used as standalone units, or teamed up with a biofilter to form a hybrid filter system for even more thorough and reliable removal of hazardous and odorous substances. A FiltaVent 60 – Passive vent filter. FCC200 – Fan assisted filter. Need expert help choosing the right solution? Got a question? Fill out our enquiry form for assistance. At OdourPro, we have an expert team who can offer advice on which carbon filter would best suit your odour issue. With over 25 years of experience, we have the specialist knowledge you need to get the right odour management strategy for your facility. We believe in long-term odour control, with all our carbon filters and other products built from sturdy, corrosion resistant materials for longer product life expectancy, saving you maintenance time and money. The Clarence Valley Council's district is known as a popular tourist destination. Brooms Head Caravan Park had a small sewer treatment system on their property which became quite odorous during peak periods, making the park conditions unpleasant for holiday makers.